"It shone with the glory of God, and its brilliance was like that of a very precious jewel, like a Jasper, clear as crystal. The wall was made of Jasper, and the city of pure gold, as pure as glass. The foundations of the city walls were decorated with every kind of precious stone. The first foundation was Jasper, the second Sapphire, the third Chalcedony, the fourth Emerald, the fifth Sardonyx, the sixth Carnelian, the seventh Chrysolite, the eighth Beryl, the ninth Topaz, the tenth Chrysoprase, the eleventh Jacinth, and the twelfth Amethyst." For long crystals have been considered extremely fascinating gems. 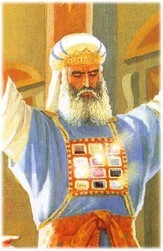 In Biblical times they adorned the breastplates of Hebrew high-priests to help them earn the grace of God. 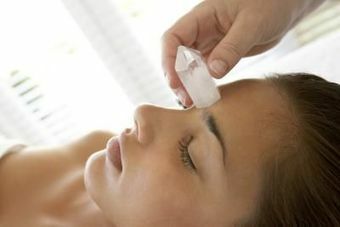 Native American tribes such as the Apaches and the Cherokees used crystals as a power stone and healing stone. Kings in ancient India were advised by the sages to surround themselves by quartz and other crystals to protect them from harm. Thus, crystals have attracted mankind from ancient times and have always helped man to connect to the realms beyond the human. Modern man has seen the prevalence of crystals from the times of the Second World War. WWII was the first time in modern history when quartz crystals were used to make a radio transmitter, which allowed the Americans and the allies to have verbal communication with their airplanes, giving them great advantage. Thereafter, quartz has played a key role in clockworks, lasers, computers, wireless transmissions, chip-design and many more technological advances. Perhaps we do not yet know if we have fully tapped into the true potential of quartz in specific, and crystals in general, but as a race we are surely on the verge of finding out! Crystals are naturally occurring mineralogical formations that are found under the earth’s surface. They have an amazing symmetry in structure, which in turn gives them tremendous potential. Crystals can verily be called the essence of life. They are quite alive and have a consciousness of their own. But their consciousness is not as complicated as humans or other forms of life. They cannot think and manipulate their roles and functions. However, they are extremely sensitive beings. This property is what gives them the unique gift to heal. Health is a natural state of being for any living organism. When the frequencies and vibrations of any being are in balance and harmony with itself, it is said to be in a state of health. However, when normal patterns are disrupted by discordant and resistant vibrations we experience disease. Crystals, due to their molecular pattern have the ability to harness certain frequencies of vibrations. They resonate and vibrate at a fixed frequency depending on their crystal-family and properties. Crystals & gemstones have a vibration that is free of resistances and disruptions. They have very strong, cohesive, balanced and intentional frequencies. For e.g. while there are certain crystals that have the ability to harness energies of wealth and abundance, there are others that can attract energies of love and harmony. There are still others that can attract the energies of self-esteem and others that can bring in lots of intuitive powers. The sole purpose of these crystals is to tap into these frequencies of energy and spread it wherever it is present. In the physical world, we believe that we merely hold a crystal or sit in its presence, but on a higher plane, our energy body interacts with the energies of the crystal and aligns itself to the patterns emitted by the crystal. This immediately begins the process of re-balancing the structure of our energy body and eventually changes us physically and psychologically. Where there is a lack in our energies, the crystal fills it up and makes us complete. Perhaps many of us would have come across astrologers and learned men recommending certain gems stones to be worn as a ring to so that our marriage (as an example) takes place in the smoothest manner possible. What they are actually asking us to do is to connect to a gemstone (crystal) so that its energies play a role in our lives and facilitate the marriage that we seek. However, whether we are receptive to the power of crystals or not depends entirely on us. Crystals are always emitting healing energies, but if we do not connect to their energies or consciously block their energies, it is of no use. 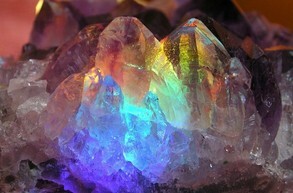 At Violet Hues, we extensively use crystals for varied forms of healing. We use crystals to ascertain the health of an individual’s chakras – not just the seven major chakras but also a gamut of minor chakras across the body. Once the state of the chakras is known, they can be dealt with as appropriate. Crystals themselves can be used to cleanse negative energies in the aura, clear and balance the chakras, effectively release negative emotions/blocks and bring healing light into the entire being. We use energized, programmed and dedicated stones to work with the individuals’ vibrations and bring it into alignment with the universal energies. Specific crystals that cater to each chakra are used in combination with hands-on energy healing to enhance the healing of the entire energy body. This is an extremely powerful experience that can facilitate Prana flowing freely through our chakras and a deep-rooted transformation getting triggered. Often one might feel a churning of sorts from deep within and traumatic wounds getting healed. After a session, physical detoxification of the body might continue for up to a week. However, the changes are always positive and gentle.